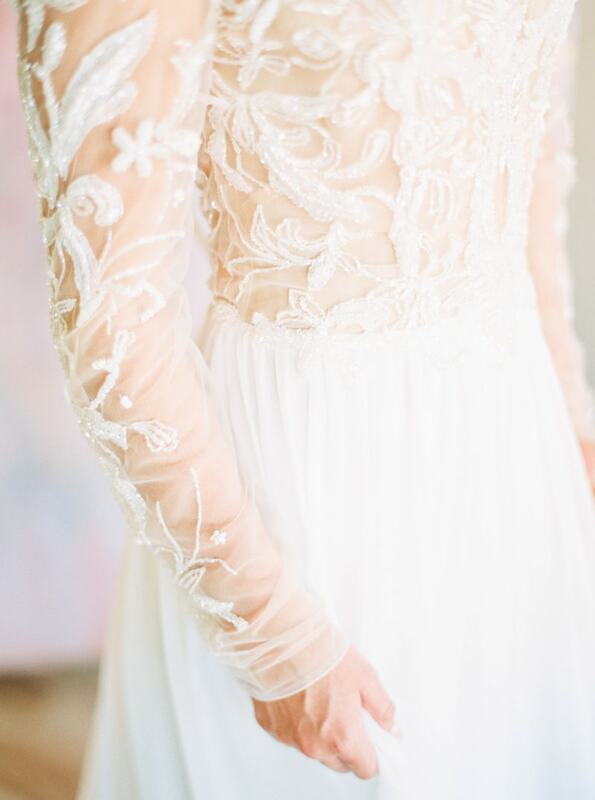 Lovely Bride Wedding Dresses. The four stunning Lovely Bride gowns in this inspirational shoot capture one thing about weddings that will never go out of style: romance. 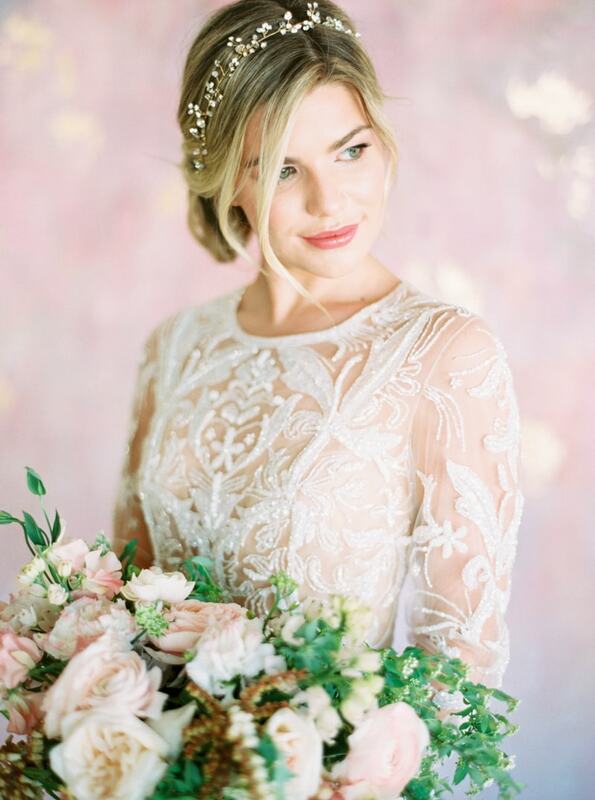 All of the bride’s looks feature timeless romantic themes alongside classic florals, a cathedral veil and a traditional white wedding cake to inspire brides who pine for all things feminine, delicate and soft. 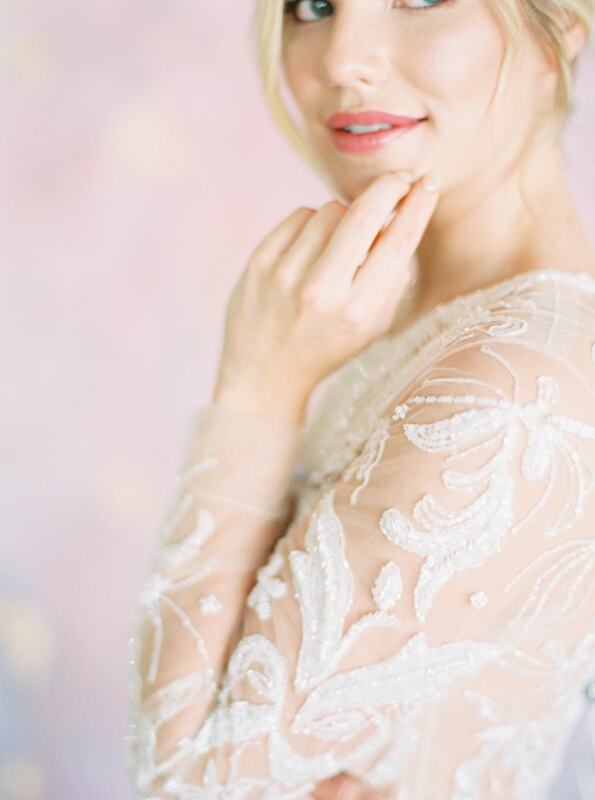 From the invitation suite’s luxe details and eye-popping envelope, it’s evident that this shoot is all about ethereal romance. 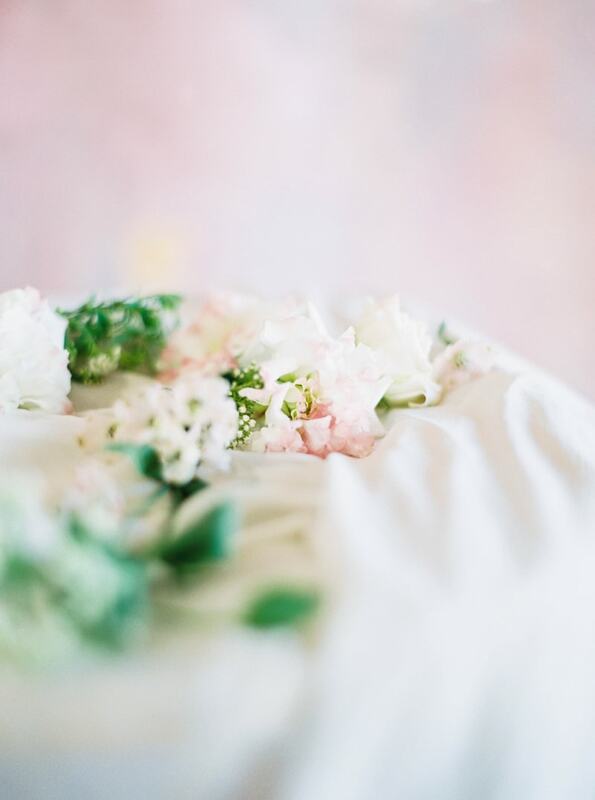 Small floral details pop up in every shot, along with distinct pink and blue pastel hues that give the shoot a soft colorful finish. 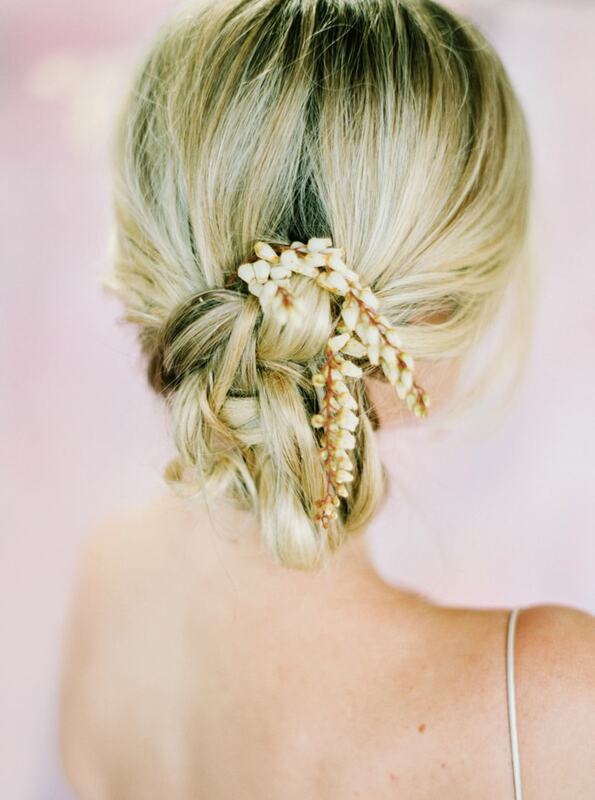 The first look features the bride accessorizing her blonde updo with a small floral headpiece. Her look is capped off with a rosy lip and natural makeup. The first gown is an illusion long sleeve lace design with a jewel neckline and breathable, flowing skirt. She coordinates with an oversized rose and ranunculus bouquet. The next look features a statement cathedral-length veil abounding with fabric that it’s hard to tell where the bride’s skirt ends and the veil begins. The gown features a sheer bateau neckline with a lace bodice and tulle skirt – the epitome of classic bridal style. Her next dress evokes a refreshing, youthful spirit with its thin straps and charming lace bodice. No matter how they’re used, flowers always equate to romance. Here, a crisp three tier wedding cake features a simple white design embellished with the placement of tiny, delicate flowers. For a breezy inspiration, the bride wears a flowing gown with thin straps, ample beading and an open back. Her hair is now styled with soft waves and she holds a bouquet of roses and greenery. Resting on a pink sofa, she shows off a lace V-neck gown that evokes simple elegance. On the other side of the style spectrum, she wears a boho-inspired look with a floral headpiece to match her off-the-shoulder lace gown. The pink hues in her headpiece match the blooms in her bouquet impeccably. Lovely Bride creations embrace an array of classic and modern styles to allow any bride to immerse herself in romance. This inspirational shoot explores the many facets of what makes romantic themes so endearing, proving that four completely different styles can all evoke the same heartwarming appeal.